The PTRD fired a 14.5mm bullet, the heaviest "small-arms" round in the Korean War. Used with deadly effectiveness by North Korean and Chinese snipers, they were deadly out to 2,000 yards, so could be pre-registered on potential lanes of attack. Seemingly striking from nowhere, the mere sound of the gigantic round roaring by ( muzzle energy 24,326 ft-lb!) was terrifying to unsuspecting troops. The 14.5mm bullet, probably the heaviest "small-arms" round found anywhere in regular service (the British .55 in converts to 13.97mm), was fired from a massive cartridge case. When redundant in its anti-tank role, the 14.5 mm became a heavy-machine gun round, and was used as a long range sniper rifle by the North Koreans during the Korean War. During WWII, the PTRD was only effective against German armor when fired from the side at point-blank range and hitting a vertical plate. Although the only effective infantry weapons against tanks by the time of the Korean War were HEAT missiles from the 3.5in super bazooka and the recoilless rifles, the PTRD-1941 was effective against ordinary transport, and much more effective and safer to use than the TNT satchel charges which were the primary anti-tank weapons available to the poorly armed CCF. Its most effective application in korea was as a long distance sniper rifle. The rifle itself, while it appeared to be simple, was actually quite an ingenious design and (according to Hogg and Weeks) probably owed something to the German PzB38. The barrel was allowed to recoil in the stock and, during this movement, the bolt rode on a cam which rotated and unlocked it. At the end of the recoil stroke, the bolt was held and the barrel moved back into battery, moving away from the bolt to open the breech and eject the spent case. A fresh round was then inserted and the bolt was manually closed. In some respects, this could be described as a "long recoil" system. The bullet was originally a steel-cored streamlined armour-piercing type, but this was superseded by a non-streamlined tungsten-cored armour-piercing-incendiary pattern. 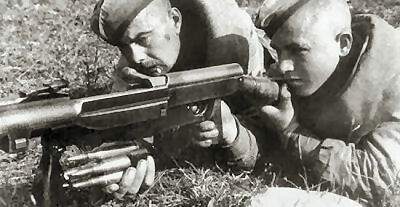 The PTRS-1941 design of Simonov was contemporary to the PTRD-1941, fired the same ammo, and allowed a clip-loaded magazine because of a more complex self-loading design. A gas piston acted on a bolt carrier to open the bolt, eject and reload in the usual fashion, and the gas regulator could be adjusted to give sufficient force to overcome dirt or freezing conditions. Nevertheless, the PTRS was less robust, much heavier (46.l lb vs 38.14 lb) and longer (6 ft 11 in vs 6 ft 7.5 in) than the PTRD. Both rifles remained in service into the Korean War. The PTRD and PTRS were the only individual anti-tank weapon available in quantity during WWII. Inadequate against tank armor, PTRD teams would aim at view ports, which mainly served only to show the gunners' position. This subsequently relegated them to use against armored half-tracks and motorized traffic, and anti-personnel sniping deployment. In Korea, the PTRD was used very effectively by both the North Korean and Chinese snipers. They were deadly out to 2,000 yards, so could be registered on positions or potential approach routes and seemingly strike from nowhere. The mere sound of the gigantic round roaring by was terrifying.